I have seen pictures of strawberries grown in gutters. I think people are growing strawberries in gutters so they are off the ground so the rain and soil don’t rot them. They are cleaner and look beautiful. Do you have any information on this method? I want to transplant my strawberries into this system. They don’t do as good when they are on the ground. My old raised beds, the wood has rotted and I need to move them soon. Plus, I have the strawberries with the runners. If I do it in an “A” structure I would cut the runners off. Put one gutter on the top of the “A” and two gutters down the sides of the “A” and so forth. Have you seen this done? I would really like to try it for this summer. How would I deal with the plants through the winter. Take the structure apart and store the plants in my basement? I would want to save them some how for the next year. Thank you for any advice or articles you can send me on the subject. Also, I have seen grapes grown over an old dog kennel. It worked very slick. The grapes grew on top and were in the kennel where the birds couldn’t get them. It looked great. I am trying to get more strawberries, and with all the rain we got last year through the summer. They didn’t do so good. Answer to: Growing Strawberry Plants in Gutters? Growing strawberries in gutters is definitely a viable way to grow strawberries. There are specific challenges, however. There are a lot of people posting pictures of their gutter systems for growing strawberries on the internet. You have probably seen some of these. There are several benefits to using gutters, and several drawbacks. In order to best answer your question, I think several areas should be discussed. 1. Minimize soil contact. Strawberry plants are small. They don’t have woody stems, so their growth is usually only about 12 to 18 inches at most. The fruit trusses that have the flowers (and eventually strawberries) are often a bit shorter and shaded by the canopy of strawberry leaves. These fruit trusses are also non-woody. When the strawberries begin to grow and ripen, they are too heavy for the fruit trusses to support. They end up bending the truss until the berries rest on the soil. This is one of the reasons straw is used in traditional strawberry beds: to keep the berries off the soil. The soil can harbor pathogenic fungi and other creepy-crawlies that can infect or infest your strawberry planting. So, keeping strawberries off the dirt is important. Additionally, rain can splash muddy soil up onto strawberries and contaminate them that way. Using gutter systems minimizes this risk. 2. Make strawberry picking easier. Since strawberry plants are short, regular picking requires either a lot of bending or kneeling. That is a recipe for sore backs and sore knees. Most gutter systems place the height of the gutters to minimize the strain on the body during picking. So, growing strawberries in gutters is a great idea for people with back and knee problems. It is important, however, to keep this in mind when designing or choosing a gutter system. 3. Strawberries grown in gutters are easy to protect. Humans aren’t the only creatures that love to nibble on strawberries. Rabbits, raccoons, possums, and especially birds of all kinds (turkeys and crows can do a number on them) all pose a threat. While no protective system short of a locked greenhouse will keep a starving animal at bay, growing strawberries in gutters does make protecting strawberry plants easier in some ways. Birds pose the greatest threat to strawberries in most places. Once they find a strawberry bed, they come back over and over as if it is their own personal bird feeder. A-frame gutter systems, wall-mounted systems, PVC systems, and other trough-based systems are usually very amenable to covering with bird netting. Bird netting will generally keep birds away and makes it much more unpleasant for rabbits and other critters to try to get at your strawberries, especially when they are off the ground. 4. Growing strawberries in gutters makes some maintenance easy. Just like picking is easier with most gutter systems, growing strawberries in gutters allows for ease during certain maintenance tasks. Snipping first-year blooms is easier, snipping runners is easier, and the renovation tasks that are still applicable for gutter systems are usually easier as well. 1. Water problems. People often plant strawberries in gutters that are level and have end-caps. This will often result in strawberry death due to lack of sufficient drainage and/or pathogenic fungal infection. To minimize this, a slope of approximately 7% should be built into the construction, and/or drain holes should be placed to prevent the gutters from filling up with water to saturation. Additionally, it can be more difficult to maintain adequate water levels as the gutters are usually more exposed. This can result in the soil drying out more rapidly. And, not enough moisture will kill the plants just as surely as too much will. 2. Insulation problems. Ground-planted strawberry plants have well-insulated roots. Many feet of contiguous ground horizontally and down protect the plants from both rapid shifts in temperature and the extremes of winter and summer. Gutter-planted strawberries have no such natural insulation. Consequently, the soil can get too hot in the summer in many places and too cold in the winter. So, keeping the roots cool enough to produce a good crop of strawberries can pose a problem for strawberries planted in gutters. And, especially in Zones colder than Zone 6, extra insulation will almost certainly be needed during the winter months to keep the roots and crowns from freezing through and dying. During the winters, you can bring the gutters into an unheated garage for extra protection. If a basement is unheated also, it would probably work during the coldest months as well, but it needs to be cold enough to keep the plants in dormancy. You must water the plants regularly to ensure that the soil doesn’t dry completely as long as they are under cover, however. Another option for those with yards or ground space that can be utilized to to dig gutter-deep and gutter-wide trenches in the dirt, then place the gutters in them, replace soil around the gutters for insulation, then mulch with clean straw. In the springtime simply remove the straw, take out the gutters, and re-assemble them wherever they were during the previous growing season. If both of those are not an option, the gutters should be wrapped with an insulating material to protect them. The material will likely have to be removed periodically to water the plants and then reapplied. 3. Growth/root problems. Strawberry roots can grow downward up to 12 inches in the right conditions. Even in poor or heavy soils, they will usually grow downward 6 inches. Many types of gutters are less than 6 inches deep and less than 6 inches wide. While the majority of strawberry roots grow in the top 3-4 inches of soil, the rest of the roots contribute significantly to both plant growth and strawberry production. By constricting the root area to the size of the gutter used, many gutter systems inadvertently limit both plant growth and strawberry production. 4. Temperature problems. The insulation problem mentioned above is similar to this. Strawberries are temperate by nature and need cooler roots to produce well. Elevating plants in gutters can make them overheat in the summers and die or produce no strawberries. Likewise, soil warmed prematurely in the late winter or early spring can induce plants to leave dormancy too early and then suffer cold injury with sharp, rapid temperature shifts downward. 5. Perennial problems. Strawberry plants are perennial by nature. The primary problems above affect the ease with which a gardener can enjoy them year after year. Additionally, strawberry plants have a productive span of about 4 years. In order to maximize production each year, utilizing the runner plants produced each year is a good idea. Rooting and then transplanting them helps keep the strawberries coming each year. This process is simply more difficult when you grow strawberries in gutters. As mentioned above, growing strawberries in gutters is a great option for people with limited space or no available soil. Gutter systems have proliferated in urban settings, rooftop gardens, and deck/patio/porch gardens all over the world. Literally, the locations for gutter gardens are almost limitless. 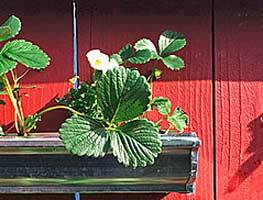 Anywhere you can affix a gutter can be a strawberry-growing location. Gutters can be nailed to sunny-side barn walls, built into vertical or A-frames, or almost anywhere else. The systems can be adapted and modified to fit virtually any vision or desire! Obviously, growing strawberries in gutters is a great option for a lot of people. Otherwise, they wouldn’t do it. But, it isn’t without challenges too. With proper planning and execution of a good gutter system, great harvests can be obtained. But, they aren’t just plant and forget systems. They require monitoring just like in-ground strawberry beds do. And, the specific challenges you might run into when growing strawberries in gutters typically mean that the monitoring process is a bit more involved and frequent. But, if you are up for the challenge, it can be very rewarding to pick ripe strawberries with minimal picking effort! So, good luck! 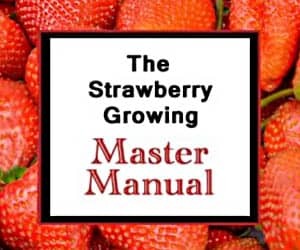 And, if you want more tips, see this: 4 Secrets to Growing Loads of Organic Strawberries. I grow mine in hanging baskets. Fertilize with 20-20-20 and have great crops. Gutters would be way too shallow for our summer temperatures. My question is about fertilizing of Strawberrys. Should I fertliize them and if so what and how much?